The T12 delivers a roaring performance and a great value for the listed price, packing a punchy, crunchy, and warm tone. This Washburn bass guitar features sturdy built and a basswood body with a slim bolt on maple neck perfectly suited for beginner bassists. Also included in the mix is a rosewood fingerboard with elegant pearl dot inlays, chrome hardware, and a set of die cast tuners. In the electronic department, the instrument packs a set of P-style pickups and standard volume and tone control knobs. This Washburn comes with an equipped set of standard bass strings and is available in elegant Black or ripping Metallic Red colour finish. The bass is very sturdy and reliable, perfectly capable of serving you well in many years to come. 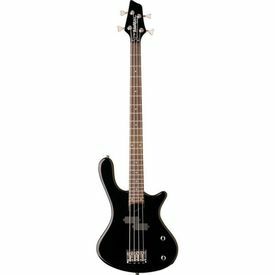 If you are looking for the best electric bass guitar for beginners on the market, this one just might be the winner.